The year was 1923 the last time France carried a Davis Cup tie against Spain. 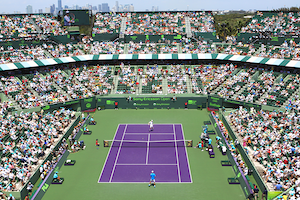 Today, the Frenchmen rectified that situation as Julien Benneteau and Michael Llodra defeated Fernando Verdasco and Feliciano Lopez 6-1,6-2, 6-7,7-6 to secure the crucial third point. In so doing, France advances to the semifinals for the first time since 2004. Yesterday in the city of Clermont-Ferrand, on a hardcourt stadium with over 6,000 rowdy fans, Gael Monfils set the tone of the quarterfinals with a 7-6,6-2,4-6,5-7,6-4 win over David Ferrer. Ahead two sets to none, Monfils took a detour which permitted Ferrer to force the match into a fifth set. After getting the early break, Monfils wiped out a break point to maintain a 5-2 advantage. But, with Monfils serving at 5-3, Ferrer climbed back into the set. However, after dropping serve, Monfils broke to give France the first rubber. The second rubber was a battle of lefthanders, Llodra versus Verdasco. For Llodra, the world number 10 presented a daunting challenge. Nevertheless, by utilizing his serve supremely, Llodra defeated Verdasco 6-7,6-4,6-3,7-6. After Llodra failed to capitalize on two set points, Verdasco prevailed in a first set tiebreaker. Still, Llodra blocked out his previous misfortunes to break Verdasco in the initial game of the second set. That was all the Frenchman needed to square the match. The second set, Llodra again captured a sole break to carry that set. After Llodra obtained the break early on in the fourth, Verdasco was able to manufacture his first break point of the match. Nonetheless, Llodra managed to turn the Spaniard away. Yet, in the sixth game, Verdasco procured a second break point opportunity and converted. Ultimately, the set was settled in a tiebreaker in France’s favor. 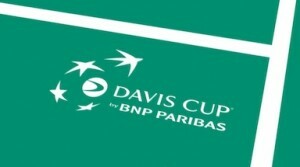 With Llodra’s first triumph in singles in Davis Cup play, France was one victory away from a semifinal berth. Today, following an easy hold by Llodra, Lopez started his game with a double fault. Later, with a backhand mid-court winner, Llodra gave France double break point. When Verdasco’s backhand volley found the bottom of the net, France secured the break. The next game, courtesy of a forehand error by Benneteau, Spain had break point. However, Benneteau served well enough to force the Spaniards into mistakes and extend France’s lead to 3-0 in the first set. With Lopez serving, after a good backhand return by Llodra, Verdasco dumped a forehand volley into the net to hand France double break point. When Benneteau connected on a forehand return winner, France stretched its advantage to 5-1. Shortly thereafter, Benneteau closed out the set. With a forehand up the line return winner, Benneteau brought France to break point. When Verdasco netted another forehand, France broke to open the second set. With a love game, Llodra consolidated for 2-0. Comfortable games by both teams kept the Spaniards just one game behind. However, serving at 2-4, Lopez committed two consecutive double faults to stare at double break point. After saving the initial, Lopez sent a forehand volley into the net. As a result, France took the game and later with a forehand volley winner by Llodra sealed the second set.